This journal recently reported on an attempt to make fish sauce according to the recipe in Gargilius Martialis in order to asses their taste (Comis and Re 2009). This experiment seemed to fail on many levels and in fact the authors are quite honest in their conclusions that a great deal of further research is needed on the nature of these sauces before we can begin to consider what they may have tasted like. By a strange coincidence, at the time when I read this article in the summer of 2009, I was engaged in the preliminary preparations for extensive experiments to manufacture fish sauces for my MA dissertation in Archaeology at Reading University. My background is one which is ideally suited to engage in this project: as a professional chef who took a degree in Ancient History and went on to become a food historian, I have published widely on Roman food, including a new edition and translation of Apicius (Grocock and Grainger 2006). In my previous research into Roman food, it was clear that it was not going to be possible to truly understand ancient cuisine without first trying to gain some comprehension of the nature of garum and liquamen, and that required first hand experiments. I conducted seven basic experiments in order to understand what happens to fish under numerous different kinds of conditions and also to understand the precise consequences of the addition of extra viscera to the production of a whole fish sauce. There is considerable confusion concerning the nomenclature of these sauces, not least because the same sauce can be defined both as an all-purpose seasoning for the masses and as a highly desirable and luxurious relish. I had previously made small quantities of the luxury garum haimation according to the Geoponika recipes but the experiments that I contemplated as I read EuroREA 2009 were on a much greater scale. I planned to use mackerel, sardine, and sprat (in up to 10 kg batches) that would be dissolved in large fish tanks so that the residue formation could be observed. It is fair to say that the outcome of Comis and Re experiments allowed me to design some of my later experiments more efficiently, for which I am grateful. My experiments are now concluded and the following is a summary of those experiments and a selective resume of the results taken from the unpublished dissertation which can be found in the Archaeology department of the University of Reading (Grainger 2010). It is rarely acknowledged that the whole concept of fish sauce is Greek in origin in terms of the texts, and its origins geographically are obscure. The process of making it has been attributed to either a Greek origin via colonies in the Black Sea or a Phoenico-Punic one in Spain (Trakadas 2004: 47). The cuisine we think of as Roman food was devised and recorded by the Greeks and developed by the Romans and was, strictly speaking, an international Mediterranean cuisine rather than simply Roman. In my edition of Apicius I have argued that the text is dominated by a Greek technical culinary language which reflect the primacy of Greece in culinary skill (Grocock and Grainger 2006: 17). Therefore the knowledge associated with the use of fish sauce, found in veterinary, medicinal and culinary literature, was primarily Greek knowledge throughout the Roman era, which is readily acknowledged in classical studies (Adams 1995: 1, 209; Dalby 1996: 179; Grant 2000: 3). The Romans were very good at empire building but they relied on Greek scientific texts and Greek practitioners for their recipes, preparations and unguents. Hence we should not consider the Greek Geoponika agricultural manual a non-Roman text and give primacy to Gargilius because he provides the only Latin recipe for fish sauce. The Gargilius recipe is of very doubtful origin for two important reasons. The recipe uses herring, which is a fish from the North Sea and not found in the Mediterranean, as Curtis has pointed out (Curtis 1984: 148). This places the recipe outside of the normal Southern European sphere and consequently a recipe associated with later development in fish sauce production in Northern Europe (Van Neer and Ervynck 2002: 208). The recipe itself also goes on to make an oenogarum (wine and liquamen sauce) which is spiced with cinnamon, mace and clove: these are spices also firmly associated with the early medieval cuisine of the Byzantine era rather than the 3rd century date of the stated author (Grainger 2006: 102 note 22). The Gargilius recipe is also unusual in using such large quantities of herbs which resulted in a green sauce. There is some evidence for herbs being added to fish sauce from amphorae residues in the 1st century AD, particularly from Masada where small amounts of vegetal residues were found in a fish sauce amphora, though identification was not possible (Cotton et al 1996: 229). Herbs are also added to the cooked recipe from the Geoponika but I am of the opinion that this green sauce is a reflection of other coloured sauces found in early medieval recipes (Scully and Scully 1995: 120). The text of the recipe is also believed to be a gloss in Classical studies and is not included in the most recent edition of Gargilius (Maire 2002). The Geoponika is also problematic of cause because it survives in a Byzantine text too. However a new edition of this text recognises that the agricultural themes contained within the Geoponika are largely an accumulation of knowledge developed in Greece throughout the Roman period rather than a reflection of early medieval knowledge (Dalby 2011:13). I believe the Geoponika is also a far more reliable source because, as Comis and Re acknowledge, it appears more comprehensive and informative. We can see that the literary evidence associated with those who made and used the sauces for example cooks, vets and doctors is either Greek or Greek in origin, while the texts associated with the people who consumed the sauces (and occasionally raved about their qualities) are largely Latin. I believe it is self evident that cooks, vets and doctors would have been better informed than gourmets about fish sauce and in fact the picture they paint is a coherent one. It is only when we try to take into account the gourmet and the picture they provide that confusion ensues. The description of fish sauce in Pliny the Elder seems to indicate that the sauce called garum was made from fish viscera and fish blood and also made from whole fish and salt and that this garum could look like aged honey wine (Pliny HN. 31.95). However, the term liquamen associated with the simple whole-fish sauce is used in the majority of later Latin texts and so the general assumption is that the name garum ceased to be used and liquamen took over to describe the same sauce (Curtis 2009: 713). The Greek recipes in the Geoponika describe a fish sauce which was clearly separate to liquamen called garon haimation (bloody) and Galen calls this garon melan (black) (Galen De compositione 12.637.k). This is clearly the sauce referred to by Pliny and also by Martial as a garum ‘made from the blood of a still breathing mackerel’ (Martial 13.102). The texts are telling us that two distinct sauces existed, however the current view in archaeology is that there was one basic sauce called garum in the early period and liquamen in the later period made from whole fish, while the blood sauce is not sufficiently recognised as a separate entity (Curtis 2009: 713). My recent experiments to harvest the blood from mackerel for the blood sauce have demonstrated that it is not possible to extract the blood very effectively if the fish is dead. The majority of blood gathers in the cranium and down the vertebral column, and in order to drain the fish of blood, the method employed by local fisherman in the Solent I have encountered is to pull the gill flaps out of live fish and drain them in sea water. Traditional methods from the south of France to prepare fresh fish for sale indicate that the nose of the fish could be cut off: the frontal bone is cut in half and the dentary and maxillary bones are removed. This allows the blood to drain (Desse-Berset 1993: 345). Ancient evidence from shipwrecks indicate that this method was also used in the ancient world, and while it has been associated with fresh fish preparation, the blood gathered could clearly be used to make blood garum (Desse Berset and Desse 2000: 79; Grainger 2010: 40). Garum: (in Latin) a blood and viscera sauce with no fish muscle. It is very dark in colour and is largely a table condiment which when of the finest is discussed by the elite (Horace, Martial, Pliny the Elder). This type of sauce has parallels in modern Japan in the manufacture of Ishiri made from squid viscera and blood. Liquamen/garon: a whole fish sauce of various size and varieties which uses extra viscera to aid digestion of the fish. It is dark/light brown/yellow, a cooking sauce, used in the kitchen and un-regarded by the elite. The term liquamen was used throughout the Roman period. Allec: a fish paste derived from the manufacture of liquamen/garon. Ancient and modern fish sauces are the result of the maceration of whole fish and salt under tropical temperatures. The viscera contain proteolytic enzymes which rapidly deconstruct the fish muscle and dissolves the protein, while the salt acts as an anti-microbial agent (McIver et al 1982: 1017). In fact, the particles of fish muscle become suspended in the liquid generated and it is this clear liquid that constitutes the fish sauce. The particles rarely constitute a product in modern fish sauce but in ancient cuisine allec was a slave ration and also a luxury paste for the table. A number of different production methods are found in the texts. The Gargilius method used by Comis and Re (2009) is an anaerobic environment. The vessel is sealed and the initial yield of liquid is relatively small, as they found, while both recipes in the Geoponika suggest that the fish is left exposed to the sun and subsequently subject to evaporation. The salt levels are indeterminate in Gargilius as the fish is layered between two fingers of salt (circa 4cm) but this resulted in a circa 1:3 (by weight) fish to salt ratio which was quite excessive (Commis and Re 2009: 35). The Geoponika has a 7:1 (by weight) fish to salt ratio which results in 15% salt. Modern fish sauce salt levels are regularly 25%. These high levels of salt result in a very slow enzyme digestion process which generally results in weak protein levels, and consequently modern sauces can take up to 18 months to yield up all the extract from the fish (Klomklao et al 2006: 443). It has already been acknowledged in the scientific journals that the modern fish sauce manufacturing process in Thailand and Vietnam would benefit from the use of 15% salt rather than their current salt levels which are largely due to local tastes and a real fear of botulism (Klomklao et al 2006: 444). Modern research has also begun to experiment with the use of additional viscera found in the first Geoponika recipe. It has been demonstrated that the additional viscera has a very powerful effect on the speed of liquefaction and protein yields (Klomklao et al 2006: 444). These conclusions also point to a very important factor that may have caused the Comis and Re experiments to fail: they selectively gutted the fish. Clearly the viscera inside every fish used is crucial to a successful sauce as well as the use of additional viscera, which has the effect of dissolving the fish from the outside. One may conjecture that larger species of fish were always cut open, exposing the viscera and I conjecture making the additional viscera superfluous. I conducted seven basic experiments in order to understand what happens to fish under numerous different kinds of conditions and also to understand the precise consequences of the addition of extra viscera to the production of a whole fish sauce. The experiments comprised various weights of fish up to 10 kg in batches of the following: eviscerated and cleaned salted mackerel; a fully eviscerated but unwashed mackerel, sardine without the additional viscera and sardine with the additional viscera and extra liquid. Finally, a sauce was made with large mackerel that were individually cut open to ensure the viscera were exposed to the salt with additional liquid. An additional experiment was added after reading the Comis and Re (2009) to ascertain the initial brine yield from whole fish both with and without exposed viscera. Each was studied to ascertain the degree of liquefaction that takes place under these different conditions and the distinctive qualities of each were reported (Grainger 2010). Here I can only give a brief resume of some of the results. The initial brine yield from all experiments was very low. In the case of the cleaned salted mackerel the majority of salt remained in crystal form as there was insufficient liquid into which the salt could dissolve. None of the experiments generated enough brine to cover the fish without compressing it with weights as shown in Figure 1 where the sardine is barely covered in liquid. The experiment to measure the brine generated from two mackerel cut open to expose the viscera and two left whole after 24 hours at room temperature using 7:1 salt yielded 35 g of brine from the uncut fish and 85 g of brine from the exposed ones demonstrating that the salt needs to come in contact with the viscera to maximise brine production. An estimate of 200 ml per kg of fish was made; however modern fish sauce is produced using minced fish which greatly increases the yield of brine. Comis and Re also virtually minced much of their fish but the lack of sufficient viscera, excessive salt and herbs clearly had a profound effect on the yield. The small varieties of fish (sprat and sardine) dissolved at various speeds depending on their size and on the amount of exposed or additional viscera that was used. The sprat (5-10 cm) broke open within 12 hours and became a paste within 5 days (see Figure 2 which shows the tank of sprat paste before the additional liquid). The larger sardines (10-20 cm), without extra viscera did not liquefy at all while even the sardines of this size with extra viscera and liquid did not fully liquefy. 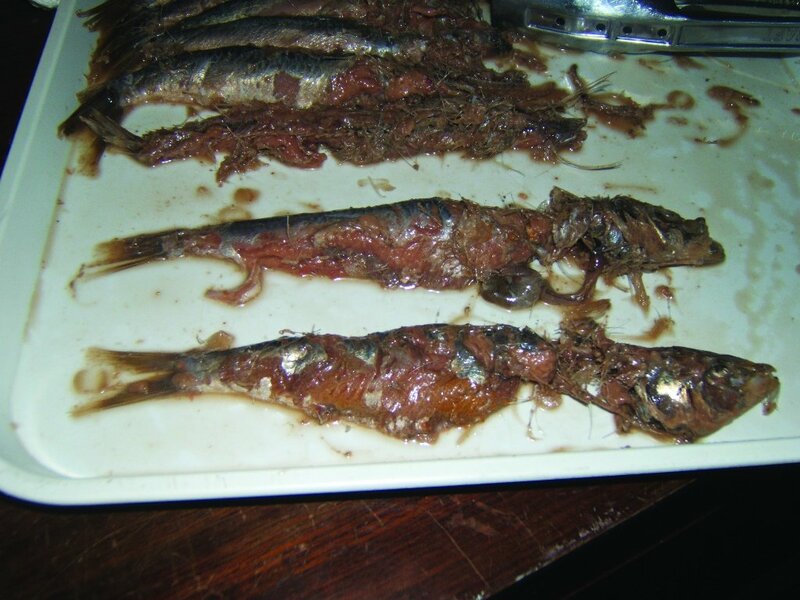 The eviscerated but un-washed mackerel also remained solid through the circa two year project demonstrating the crucial importance of the enzymes associated with the viscera. The low yield of brine in the sprat and sardine experiments meant that the liquid rapidly became saturated in particles of muscle tissue which resulted in a halt to the dissolving process. It was only possible for the sardine to become a paste if there was sufficient liquid for them to dissolve into, otherwise the fish remained suspended. There was a clear need for extra liquid to be added, particularly as most of the natural brine generated would eventually evaporate away in the heat. The fish tanks were covered but not sealed and housed in a green house to duplicate the Mediterranean temperatures. The sardine experiment lost nearly 2.5 l of its volume to evaporation after 80 days which concentrated the generated sauce into a thick paste with limited potential sauce. As already noted, two of the three recipes suggest the sauce is made while exposed to the heat of the sun. The tanks associated with the processing sites in Spain and North Africa may have been covered to keep the surface free of debris and some factories appear to have had roofs over the tanks with large windows, but they are unlikely to have been fully sealed. (Ponsich and Tarradel 1964: 99). I had assumed the recipe in the Geoponika that calls for wine to be added to the fish was a reference to the kind of composite sauces that were made with wine in the kitchen (oenogarum) referred to in Apicius (Grocock and Grainger 2006: 386). The obvious need for extra liquid at the beginning of the process made me re think this assumption. The manufacturing tanks range in size from 1 - 4 m wide and 1 - 3 m deep (Curtis 1991: 54). It would not be possible to stir such a large amount of fish, to encourage the liquefaction process as the recipes suggest, in the limited amount of brine that is naturally produced as the paste would be too thick. The ratio of extra liquid, wine in the case of the Bythinian recipe but we might just as easily imagine brine being used, was 1:2, that is, for every one volume of fish two of wine was added, which seemed far in excess of what might be expected, and I therefore took the ratio to have been corrupted during the texts transmission and reversed the volume of wine. This addition immediately caused the fish to continue dissolving as before, but as the enzyme activity had been both slow and weak (which may have been due to the absence of extra viscera) the process continued to be very slow and after circa 250 days 25% of the sardine, which comprised those over 12 cm, remained structurally intact: the cavity was heavily eroded but the shape was still discernable and the head was still attached (see Figure 3 for the sardine over 12 cm after 115 days). The following year, two new experiments were devised: sardine of similar size (8-20 cm) with 15% salt and 10% by weight of extra viscera from mackerel and additional liquid at the original ratio: 1:2 and also cup open mackerel, salted at 15% with the same additional liquid. In both cases the fish began to dissolve rapidly and within 2 weeks all the flesh has dispersed into the liquid and the bones had become fully disarticulated and had sunk to the bottom. The speed of liquefaction was remarkable and in fact the sauce generated was both weak in colour and subsequent protein. A rapid spoilage of the sauce ensued over the next few months and the sauces had to be discarded. It was determined that too much additional liquid was used, resulting in a sauce vulnerable to bacterial decay. However this result demonstrated that some additional liquid was necessary, though not so much that the sauce becomes too diluted. 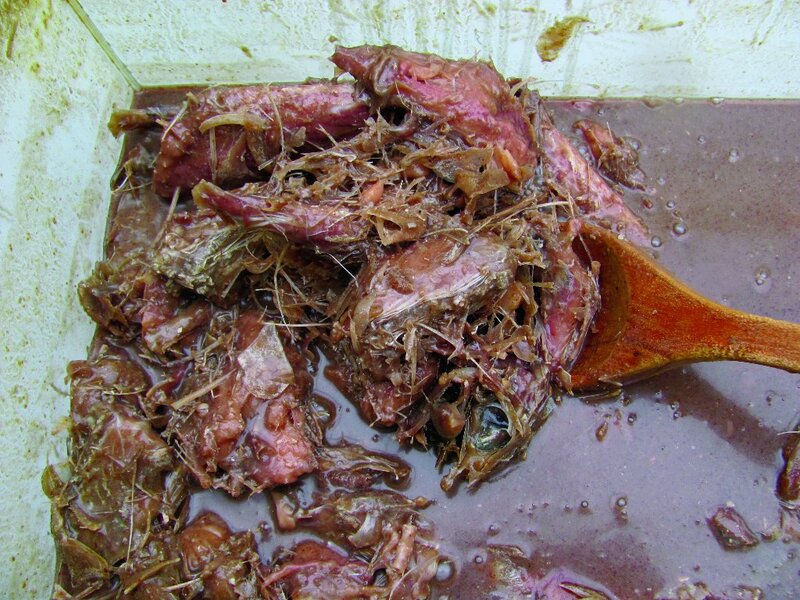 It is also clear that both exposed and additional viscera was necessary to ensure sufficient fish tissue could liquefy particularly when large quantities of small and medium sized fish such as sardine and anchovy were used to make fish sauce. The conclusion currently taken is that extra viscera would have ensured that the enzyme activity is strong enough to liquefy the maximum amount of flesh particularly for smaller fish that are not cut open. Fish of medium/larger size (15-20 cm) which are cut up so that the viscera is exposed would also benefit from extra viscera to speed up the process but in all cases extra viscera would not allow all the flesh to dissolve at once. Both sizes of fish require the minimal extra liquid necessary to ensure the maximum amount of sauce could be generated while leaving the remaining un-dissolved flesh to form a second quality sauce. 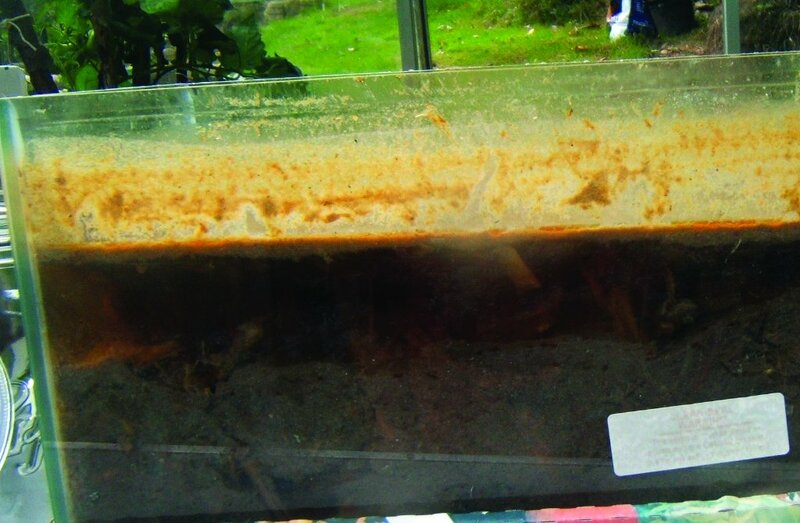 The sardine sauce (without viscera) formed above the bones in the tanks as a thick emulsion with small layers of clear liquid trapped within it. This liquid initially came to the surface after about 2-3 weeks and could have been taken relatively easily while leaving the particles and bones behind, but this seemed far too soon considering that the recipes suggest three months (see Figure 5 for the sardine sauce forming above the particles). The tanks were regularly stirred to encourage the remaining fish to breakup which forced the emulsion to reform. 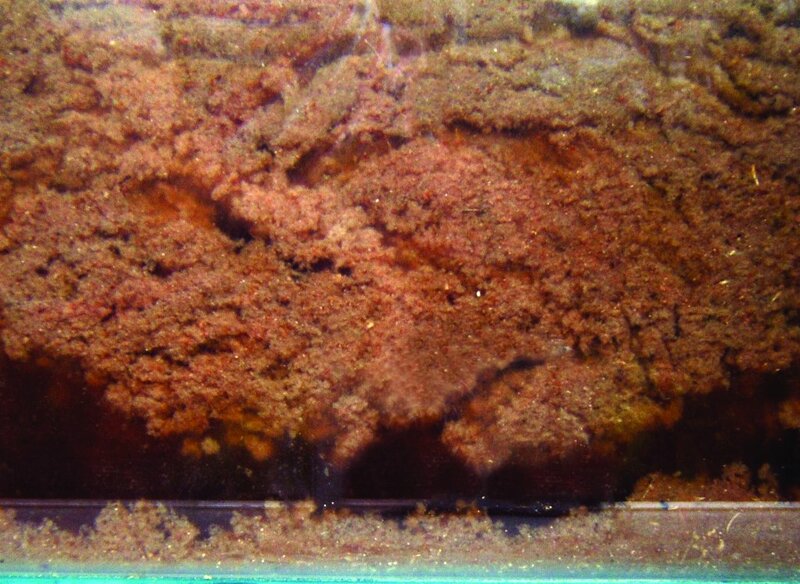 Eventually the clear and now darker liquid began to settle out beneath the particles which appeared to rise to the surface (See Figure 6). Something interesting had happened to the liquid during the stirring process; as more of the protein had dissolved into the sauce the particles became lighter and therefore floated above the now richer sauce. It was now impossible to take the clear sauce without the particles. The separation of liquid from particles was always unstable and movement or penetration resulted in the reforming of the emulsion. The sauce was eventually removed after 90 days using the method described in the Geoponika: a plastic wicker basket was pressed into the surface of the liquid and the emulsion flowed in. 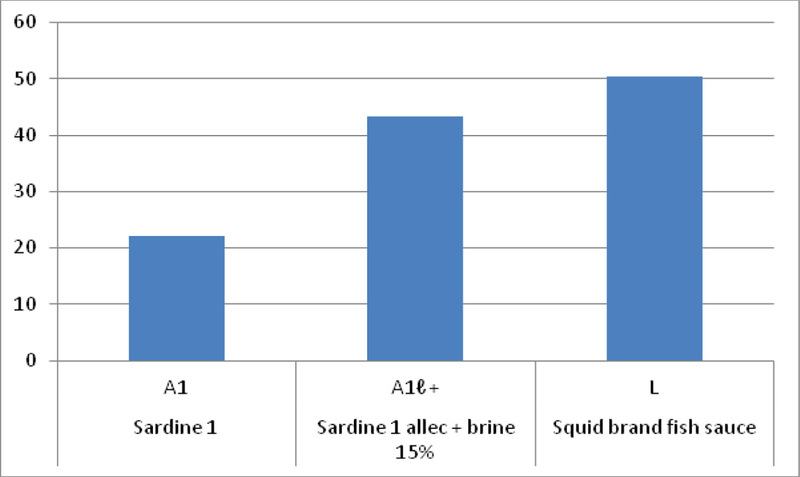 Extensive laboratory tests (which cannot be reported on here in detail) determined that the sauce extracted from the sardine without extra viscera was at that time half the protein level expected of modern fish sauce but had acquired levels equal to modern fish sauce after being stored as an emulsion for a further two months (Table 1). This is an extremely interesting result as it suggests that a sauce transported as an emulsion over long distances would be far superior to one that had been taken and filtered immediately or extracted from the surface of the tank as soon as it forms. Fish sauce from Spain was always considered superior to any local production methods and if the Spanish fish sauce was transported unfiltered there was good reason for this higher quality (Pliny HN. 31. 93). Table 1. Protein levels of various sardines sauces (in mg/ml). It is clear that the first processing of a batch of fish for sauce cannot liquefy all the muscle tissue present even with extra viscera and additional liquid. After the first sauce is taken as an emulsion the bottom of the processing tank would contain sufficient solid muscle tissue as well as a thick emulsion among the bone to generate a second sauce if it was re-brined. Modern fish sauce production in Thailand utilise this method to generate a second sauce. I also consider it likely, given the fish bone evidence below, that this sauce could and was generated in the amphorae freeing up the tank to make more sauce. The fish bone evidence associated with shipwrecks has until now either been assumed to be salted fish or the separate fish paste product allec. This is believed to be the residue derived from fish sauce production which was marketed in its own right as a paste containing bone (imagine Gentleman’s relish but you had to remove the bone first!) (Van Neer and Ervynck 2002: 208). It is now quite possible that the extensive evidence from ships wrecks of amphorae almost full of sardine and anchovy bones of a size associated with fish sauce (3-20 cm) and which are deemed to small for sale as a salted fish product, may be this second quality liquamen sauce being generated in transit (Grainger 2010: 33-42; 68). This product would require further processing at the port or market where it would be drained from the bone residue which was left inside the amphora and discarded: a scenario which in fact is frequently encountered. Fish sauce amphorae are often found in ditches and rubbish pits containing large amounts of fully disarticulated and eroded small-fish bones which are assumed to be the remains of the discarded fish sauce residue known as allec (Van Neer and Ervynck 2002: 208). This is generally considered a product in its own right: a bony fish paste rather than, as we now see it, simply the remains of a fish sauce processed in transit. This scenario is particularly connected to the large scale bulk production process in Spain and North Africa, where extra liquid and viscera would allow the first sauce to be generated quite quickly, and as it was transported as an emulsion its quality would improve in transit. The second quality sauce would also be generated in transit in the amphora. This may have allowed the tanks to be emptied and refilled many times within a fishing season, vastly increasing the potential yield of sauce from each tank. The method employed to manufacture a local and small scale product seems to have used a different technique. According to the recipes the small vessel or dolium was sealed and not subject to evaporation and no apparent extra liquid was added initially. We may surmise that the Greeks and Romans valued the first and natural yield of liquid from the macerating fish above any sauce made from subsequent washings in brine. However, the limited brine yield means that only a fraction of the fish is able to disperse and yield its protein into the liquid. This may constitute the first and therefore seemingly the best sauce, but as it could be taken after less than a month of maceration, according to Gargilius, it was unlikely to be high in protein. There would also have been something like 60% -/+ of the remaining fish only semi- dissolved, which could be re-brined many times and the process continued until all the muscle tissue had dispersed. This is reflected in modern methods, where anything up to six washings of the fish with brine are used to harvest all potential fish extract. The Comis and Re experiment extracted limited brine because of a lack of viscera; it also probably used too much salt which could not dissolve and remained in crystal form, making the mixture grainy. It would have been possible to manufacture a superior sauce simply by the addition of brine to reconstitute the sauce and flush out the protein. It has been possible to demonstrate that two production methods may have been used to manufacture fish sauce. The bulk version utilised extra viscera and liquid and needed both to extract all the nutrients from the fish. This method made two qualities of sauce: an emulsion made up of fish muscle particles in liquid and the bone residue and emulsion with extra brine, and the quality of both was able to improve in transit from Spain and North Africa in amphorae. The small scale local process may have taken the first sauce from a batch of only semi-dissolved fish as an emulsion too; this may subsequently have been filtered relatively quickly, either by the merchant or the purchaser, and the remaining fish was repeatedly washed with brine to extract further sauces in situ. Crucially the local production process meant that the sauce was extracted from the emulsion quite quickly which reduced its quality. My fish sauce experiments will continue into 2011 and beyond with recipes that have been formulated to maximise the yield and the speed of liquefaction. It has not been possible to discuss the bone free fish paste residue which clearly forms the majority of allec found in the spike of amphorae in more detail. However it may now be recognised as a potential fish sauce concentrate that could also be reconstituted with brine to generate further sauces that were no doubt considered low quality but may actually have been quite high in protein. Within this project I have also studied the shape and form of many fish sauce amphorae and particularly in relation to the residue formation (Grainger 2010: 68). Research in the future will concentrate on the implication of my study for the understanding of the form and function of fish sauce amphorae. 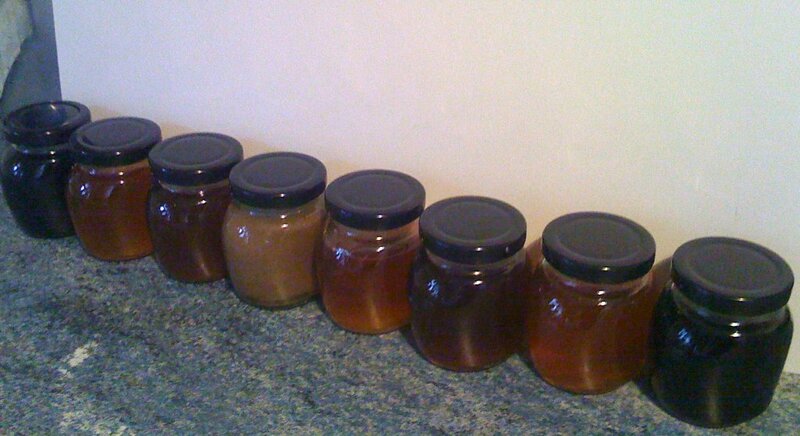 Figure 7 shows a selection of the filtered sauces demonstrating the potential variety of shades of brown that are possible. The so-called liquamen is made thus. Fish entrails are put in a container and salted; and little fish, especially sand-smelt or small red mullet or mendole or anchovy, or any small enough, are all similarly salted; and left to pickle in the sun, stirring frequently. When the heat has pickled them, the garos is got from them thus: a deep close-woven basket is inserted into the centre of the vessel containing these fish, and the garos flows into the basket. 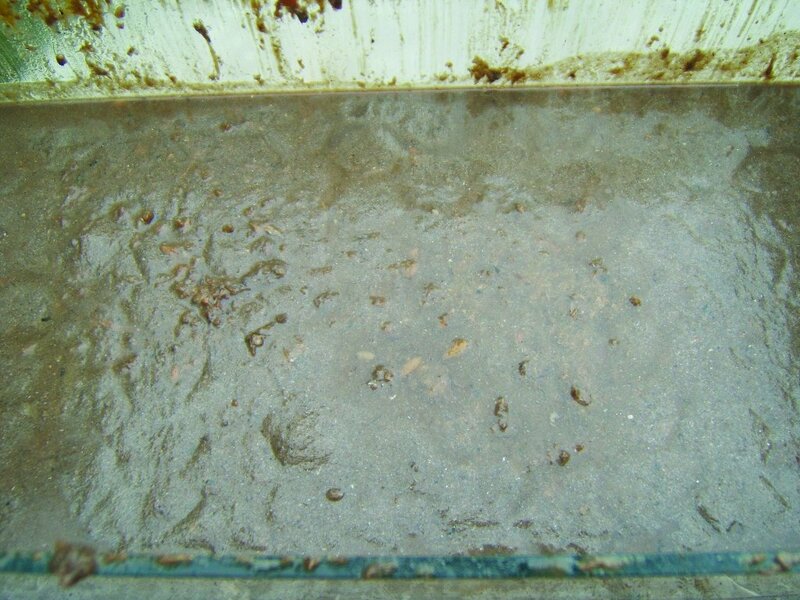 This, then, is how the liquamen is obtained by filtering through the basket; the residue makes alix. The Bithynians make it thus. Take preferably small or large mendole, or, if none, anchovy or scad or mackerel, or also alix, and a mixture of all these, and put them into a baker’s bowl of the kind in which dough is kneaded; to one modios of fish knead in 6 Italian pints of salt so that it is well mixed with the fish, and leaving it overnight put it in an earthenware vessel and leave it uncovered in the sun for 2 or 3 months, occasionally stirring with a stick, then take [the fluid? ], cover and store. Some add 2 pints of old wine to each pint of fish. If you want to use the garon at once, that is, not by ageing in the sun but by cooking, make it thus. Into pure brine, which you have tested by floating an egg in it (if it sinks, the brine is not salty enough) in a new bowl, put the fish; add oregano; place over a sufficient fire, until it boils, that is, until it begins to reduce a little. Some also add grape syrup. Then cool and filter it; filter a second and a third time until it runs clear; cover and store. A rather high quality garos, called haimation, is made thus. Take tunny entrails with the gills, fluid and blood, sprinkle with sufficient salt, leave in a vessel for two months at the most; then pierce the jar, and the garos called haimation flows out. Naturally oily fishes are caught/ taken, such as are salmon and eels and shad and sardines or herrings, and an arrangement of the following kind is made of them along with dried fragrant herbs with salt/ they are put together with fragrant died herbs and salt in this way: A good, sturdy vessel. well pitched, with a capacity of three or four modii, is got ready, and dried herbs with a good fragrance are taken – these can be garden or field herbs – namely dill, coriander, fennel, celery, sicareia, sclareia?, rue, mint, sisymbrium (?wild thyme), lovage, pennyroyal, oregano, bettony, argemonia, and the first layer is spread out at the bottom of the vessel using these. Then the second layer is laid down using fish –whole if they are small, cut in pieces if they are larger – over this is added the third layer of salt two fingers deep, and the vessel is to be filled right to the top in this, with successive triple layers of herbs, fish and salt. It should then be closed up with a lid fitted and put aside as it is for seven days. When the seven days are over, the mixture should be stirred right to the bottom, using a wooden paddle shaped like an oar, twice or three times every day. When this process is complete, the liquor which flows out of this mixture is collected. And in this way liquamen or oenogarum is made from it. Two sextarii of this liquor are taken and are mixed with half a sextarius of wine, then single bundles of (each of) four herbs – viz. dill, coriander, savoury and sclareia. A (one) little handful of fenugreek seed is also thrown in, and of the aromatics thirty or forty grains of pepper, three pennies of costum by weight, the same of cinnamon, the same of clove, and when pounded up finely these are mixed with the same liquor. Then this mixture should be cooked in an iron or a bronze pan until it reduced to a sextarius in volume. But before it is cooked half a pound of purified honey ought to be added to it. When it has been cooked it ought to be strained through a bag like a medicine until it is clear – it needs to be boiling when it is poured into the bag. When clarified and cooled it is kept in a well-pitched vessel in order to give flavour to opsonia. COMIS, L., and C. RE, "The archaeology of Taste: Gargilius Martialis's Garum", euroREA. Journal for (Re)construction and Experiment in Archaeology, vol. 6/2009, Chlumec nad Cidlinou (CZ), EXARC, pp. 33-38, 2009. CURTIS, R., Garum and Salsamenta. Production and Commerce in Materia Medica, Leiden, Brill, 1991. DESSE-BERSET, N., and J. DESSE, "Salsamenta, garum, et autres préparations de poisson. Ce qu’en disent les os", Mélanges de l’École Française de Rome Antiquité, vol. 112, pp. 73-97, 2000. GROCOCK, C., and S. GRAINGER, Apicius: a Critical Edition with Introduction and English Translation, Totnes, Prospect Books, 2006. PONSICH, M., and M. TARRADEL, Garum et industries antiques de salaison dans la Mediterranee Occidentale, Paris, Bibliothèque de l’École des Hautes Études Hispaniques, 1956. Fig 2. The tank of sprat paste. Fig 7. The sauces manufactured in 2009.